Chrodegang of Metz (c. 712-766) was a leading figure of the late Merovingian and early Carolingian Church. Born to one of the principal aristocratic families in Austrasia, he served as referendary of Charles Martel, and was appointed bishop of Metz in the 740s. As bishop, Chrodegang became one of the foremost churchmen in Francia, chairing councils, founding monasteries, and beginning a reform of the lives of the canons of the Metz cathedral. This book is a major study in the English language on Chrodegang, examining his preoccupation with the creation of communities of faith and concord modelled on the early Church. 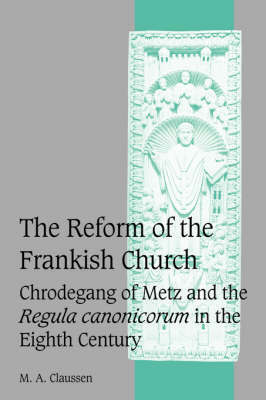 It explores his attempts to unite the Frankish episcopacy, his rule for the cathedral clergy in Metz - the Regula canonicorum - and his introduction of new liturgical practices that sought to transform his see into a hagiopolis, a holy city which provided a model for later Carolingian reform.